Limited stock, only 1 bottle left. A true blast from the past, Glenfiddich Caoran Reserve revives a forgotten taste: a bold, powerful single malt Scotch whisky that captures its native rugged landscape with every mouthful. First comes a smoky aroma, then spicy top notes that develop into a characterful blend of sweet fruit with distinctive peaty undertones and a smooth, lingering finish. Its name, pronounced ku-ran, comes from the Gaelic for "peat ember" - this whisky's underlying theme. Its inspiration comes from the days when coal shortages meant greater amounts of local peat were used to dry the malted barley. 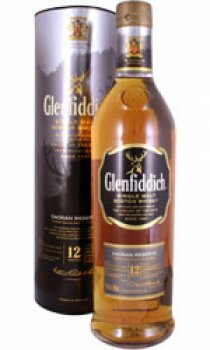 This distinctive smokiness complements perfectly the fruit notes so characteristic of Glenfiddich.